Originally featured in the Omaha World-Herald on July 12, 2014. In 1956, Willa Cather Library, 1905 S. 44th St., opened as the fourth branch in the Omaha Public Library system. The site was selected to meet the growing population in southwest Omaha, and because of its proximity to the new Center Shopping Mall and Norris Middle School. At the time, Willa Cather Library was considered an architectural experiment with a contemporary design. Wall-sized windows were installed facing Center Street not only to provide sufficient interior lighting, but also so passers-by could clearly see the book collection displayed inside, just as one might in a retail store. The facility also featured garage space to house the library’s Bookmobile. It was affectionately dubbed “The Rainbow Library” by then library director Frank E. Gibson. Much thought went into the selection of the location’s interior color scheme, and in a major departure from tradition, end panels of the bookshelves were painted purple, blue, bittersweet red, yellow and white. Colors were mimicked in the furniture and décor. Architect Leo A. Daly specially designed library tables and the main circulation desk; and Alfred A. Knopf Co., the publisher of Cather’s books, presented the library with a display case to match the other furniture in the building. The most dramatic element of décor was not visible to the public: a staff room with a jet black floor, a patterned brick wall, two white walls, and a purple wall. A renovation in 1986 replaced the “rainbow” with subdued colors to create a more modern look. However, visitors to Willa Cather Library will still find its 1950s retro-style, numberless, starburst clock behind the circulation desk. 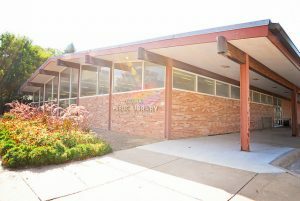 Named for one of Nebraska’s most notorious authors, Willa Cather Library serves a diverse community and offers a variety of programs including story times and book clubs. Several community groups also make use of the space for knitting club, Girl Scouts, language-speaking workshops and more.